It’s easy to feel dissatisfied with our homes, isn’t it? To concentrate on their flaws and fantasize about the picture-perfect places we’d rather live. Today I was thinking about ways I have found over the years to be happy at home, even when it was far from ideal. 7. 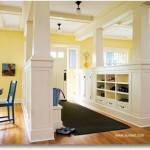 Create character where there isn’t any–crown molding works wonders! UPDATE: Check out my follow-up post with some of my favorite reader responses: 20 MORE WAYS TO BE HAPPY AT HOME. I love candlelight dinners!!! I also love to have fancy dinners even if no one is coming over…having a nice meal in a clean house makes my little condo feel like a real home! The BLAH BLAH BLAHger’s last blog post..Turning Store Bought Curtains into Custom Beauties! Great list of ideas Julia! I love the one about “happy colors!” Having a lot of color around me makes me feel so much better! Julia, I needed this list! I need to go back and revisit why I fell in love with this house all over again! Thank you! well that is the truth. a home is more then where you put you feet up and do the laundry. its where you come together like a cave and love one another threw the good times and the bad. its your ark in the middle of the sea. Two words:Chaise Lounge. I have a plastic one from Walgreens, $12.99. For that one hour a year when I feel I have the time to lie down in the California sunshine with a book — now that’s nirvana! always have a great candle ready to burn. Not good…but great. And fresh herbs in little pots or antique creamware…and scissors to USE them. Great advice. I think adding a cleaning lady to that list would be wonderful but that’s not in my budget so I guess it’s just me. Moldings are a great tips! Great list 🙂 I don’t know if there’s much to add, colors are on the top of my list together with moldings. Take a good bath at least once a week, and read a good book. Given the economic downturn with the housing market, many homeowners are putting aside their “more is better” aspirations. There’s creative motivation to seek ways to live “better” and more comfortably in the homes we already own. Often, it’s the simple things that make a huge difference. We do most all of the things on the list! I even do candlelight breakfasts on the weekends. Music is a big part of our family, so that is always playing! Living in an older home (built in 1879) I am lucky enough to have all the little details like crown moldings, wood floors and all the dings and bumps from former owners (which would be considered character right? lol). I LOVE my home! Ooh I love this list. I am in the process of de-cluttering now, and it feels so wonderful. We also have music on at home all day – and only turn on the tv after dinner (or during dinner if the baby is in bed already!). Great ideas. I would add – make every room in your usable. I don’t see the point of having a ‘fancy room’ – we actually use every room in our house all the time. Even the guest room – Fiona and I play in there sometimes, just for a change of scenery. Loved this post, as usual Julia!! christy’s last blog post..Vegetarians Driving Hummers? Read on to see what I’m talking about! Good list! I also think that not being afraid to change something about your home is a good one. I know too many times I get scared of a project and I put it off, only later to find out it wasn’t that hard and it made a huge difference. Clear out as much clutter as possible, clean off the kitchen countertops, open the curtains/blinds and let in some light! Every once in a while I buy a piece of furniture or wall accessory that just catches my eye at first sight – whether or not I have a place for it at the time. The things that make me the most happy in my home are these pieces with a great story of my impulse buy! I love folk art. I have a gigantic PEACHES sign from an old farm stand that makes me smile every time I look at it, and a four foot tall “girl” that hangs on the wall. She was the mascot (can’t remember the right word) for the Tomboy grocery store chain in St. Louis. She will be with me forever, that was one of the best purchases I’ve ever made. For me, things like that I can’t live without. Fantastic list! I listen to classical music all day…I call it my “house cleaning music”. When ever I hear classical tunes I feel like cleaning and organizing and all the while appreciating all I have to clean and organize! I love the fresh flowers idea…you can also snip some budding branches and bring them indoors…I think some Vivaldi and Pine~sol are in my near future…love it! I like to “borrow” things from my parents’ house. That way I have memories to grow on with my own family. What a great post! I’d add, Don’t follow decorating rules if it goes against following your own instinct. Great list!! Not sure if I could add anything to that or not! Love this!…especially #10. I’d only add one thing, and you really already touched on it, surround yourself with things you love – things that make you feel good. Love your list! I think making memories in a home makes it more pleasing. And therefore more satisfying for your everyday life. I keep on thinking I should use my wedding china just for a regular dinner one night. Just so I can say that’s not just for special occasions. Great list! I think I abide by almost all those rules, except for possibly the candlelight dinner. With alot of children running around it makes it hard. I might add, “paint will refresh a spaces and make you feel delightful”. 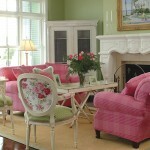 I wish I could paint everyroom a new color every 18 months or so. I love hanging out in the paint chip aisle. Suzy’s last blog post..When will Spring Come?…. These are all wonderful reminders! I always struggle with contentment, but when I focus on the stuff I love, all the other stuff gets less noticeable. It’s great to also create a home that’s a living space. A place that’s functional. Not just visually pleasing. To that, I’d add a room or space that is for relaxation. A place to go to escape work or studies. A breathing room of sorts. I don’t think I would add a thing to your list Julia. It looks like you have it covered very well!! I’m working on #2. We’ve lived here 1.5 decades & stuff happens ! Started with my closet. Didn’t realize how many pairs of black sandals I own. Great post Julia. It’s so easy to get “caught up” in everything. We all need to step back and be thankful for what our homes are. I’ve got a long list of things I gotta do, and for that I’m thankful. Thanks for the gentle reminder. Make sure to take the time every morning to enjoy your favorite hot beverage before starting your day. Hi, and I’ve loved your list! I always love to have a scented candle burning in my entry and love some cherished memories around! I’ve been decluttering and it’s amazing how much calmer I feel in these rooms. Even where no one else can see – behind cabinet doors – but I know, and I love it! I have found I am much happier if I work at wanting what I have rather than having what I want. I love your pictures and look forward to your posts!! I am really enjoying that list, good reminders that we all need at times. And it WAS timely, for me, at least! Great list, and I love the quote. Great post!! I never turn down free items from my Mom, MIL, or grandparents. Sometimes it’s not really my taste, but the history behind each item usually wins me over, and I’ll use it anyway! And you never know if maybe it just might be the thing your kids will love when they’re adults! I LOVE your blog!! This was just the nudge I needed to get me excited about an idea I have been toying with. My Mom gave me a gorgeous burgundy tablecloth for Christmas. I have been hesitant to put it on the table…It will likely get something on it post haste. However, I am going to get it out and set my table with my Grandmother’s China. An inheritance. I can’t wait to see it all put together! Oh so true. I think I will print your list and tape it to my front door! Actually I’m content with my beautful home! 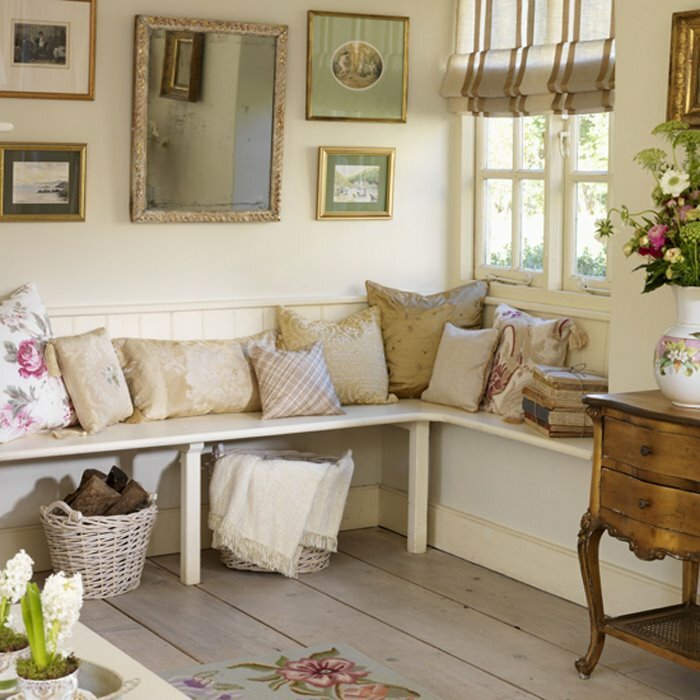 I enjoy bringing SPRING inside my home. The abundance of spring bulbs that surprise me everyday are like happy little presents peaking out and jumping up from under the cedar mulch. I’m always finding something pretty in which to decorate nightstands, kitchens, fireplace mantels and my foyer with fresh blooms from my garden. I love your list! So very true!! I need to appreciate what my house has to offer! Hi Julia, great post and very true. I have turned my tv off and am trying to have fun ‘quickly’ on my one day off. I love that peaceful looking room. Very serene! Hope your day is lovely! 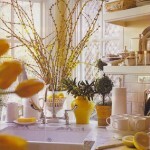 I love the idea of keeping fresh flowers in the house. Especially during Spring time. Hello Julia. Love you blog and especially loved this post – it really rang true with me. So I have wrote about your post on my blog (with a link to this post). Thank you for the inspiration! Love the list and need to follow your # 2 item more. I am a cluttery mess lately. laura @ the shore house’s last blog post..I ? junque. My suggestion is to use your good stuff. I love having friends over and getting out all the china and crystal and other do-dads, no matter that I have to wash it all later. As I always say to people who want to put their brownie on their entree plate, “No, no, no! You’re worth the extra plate!” And on those minor holidays like Valentines, St Patty’s Day, etc, I always use the good stuff and prepare something nice for breakfast for my girls. It reminds people that they’re special. What a lovely list! We decided a few years ago that we might as well use our real silver every darn day. I mean, why not? Sure it is a pain to wash by hand but we’re used to it now. It makes every meal special and does not go unappreciated. The set we use was my husband’s grandmothers so it reminds us of her daily as well. There’s not one thing I could add to the list- it’s perfect! Glad I stumbled across it at a time I needed to see it most! Thank you for posting. Great list! I’d suggest that when you’re craving change or thinking of spending money on something new to look around first; maybe re-arrange your room, change a few pictures around, dig out some once-loved bed linen. Anything that gives a freshen up but doesn’t involve bringing new things into your home or spending monet. .-= Edwina- HouseAHolic´s last blog ..The most unusual looking house ever? =-.